“Ruritanian Romance” is a genre consisting of stories, novels, dramas and films set in a fictional country. Anthony Hope’s novel “Prisoner of Zenda” based in the imaginary state of Ruritania was the pioneering novel that spawned this popular genre. Literature, theatre and films of this genre are generally about romances between Royalty and commoners occurring in a fictional country with the melodramatic backdrop of plots, intrigues, action and adventure.Many films have been made in many parts of the world that could be categorised as belonging to the “Ruritanian Romance “genre. “Veerathirumagan” was a Tamil film belonging to the Ruritanian romance genre, It was released in India on May 3rd 1962.The film was screened some months later in Sri Lanka then known as Ceylon. Even before the film hit the screens , the songs in the movie popularised by Radio became runaway hits. The Tamil commercial service of “Radio Ceylon”played a big role in this. In those days “Radio Ceylon” or “Ceylon Radio “ as it was known in India, was most popular over the air waves in Tamil Nadu. The basic story line in the film “Veerathirumagan” was about a romance between a Princess and a valiant commoner. The lead roles were played by C.L. Aanandhan and Kumari Sachu whose real name was Saraswathi. This was Aanandhan’s second film as lead actor after “Vijayapuri Veeran”. As for Sachu who had acted as a young girl in several earlier films, “Veerathirumagan” was the movie which starred her first as heroine.The film was the maiden directorial venture of the great A. C. Trilokchander who passed away in 2016 at the age of 86.Trilokchander wrote the screenplay also for “Veerathirumagan”. The dialogues were written by Aaroordas. A.C.Trilokchander whose full name was Arcot Chengalvaraya mudaliyar Trilokchander had a masters degree in economics. The six foor three inches tall Trilokchander had written the story and screenplay for “Vijayapuri Veeran”produced and directed by Joseph Thaliath of Citadel Studios. Trilokchander who worked as an assistant director on the film had adapted the story on “The Three Musketeers” by alexander Dumas. Vijayapuri Veeran was very successful at the box office. It was then that the actor S. A. Asokan introduced Trilokchander to AVM Saravanan of AVM Studios. Trilokchander had written the story – screenplay for “Veerathirumagan”.Saravanan liked it and wanted Trilokchander himself to direct it. Veerathirumagan was actually made by the famous AVM Productions owned by AVM studios proprietor AV Meyyapan Chettiar. Veerathirumagan was however produced under the banner of Murugan films.Murugan was the eldest of AVM Chettiar’s four sons. The others were Kumaran, Saravanan and Balasubramaniam. Films produced by AVM had generally been family oriented social dramas but Veerathirumagan was an action oriented costume drama.AV Meyyappan’s sons Murugan, Kumaran and Saravanan had wanted to produce a film in this new genre. So AV Meyyappan asked the trio to do so under a different banner.He was reluctant to produce an action film under the aegis of the traditional AVM productions. Hence the new production company was called Murugan films after the eldest son (The youngest Balasubramaniam was then a school student and not included as a producer). 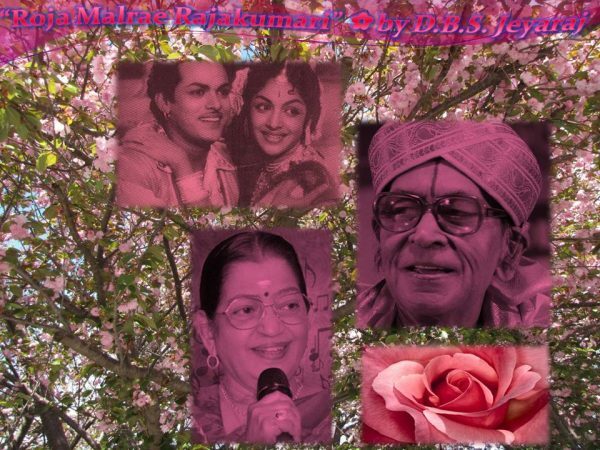 Among the several songs in the film the most popular one was “Roja Malarae Rajakumari” sung by P. B. Sreenivas and P. Susheela. The words were written by lyricist “Kavingar” Kannadasan. The music was composed by the “Mellisai Maamannargal” duo M. S. Viswanathan and T. K. Ramamoorthy. The song in the film was picturised on Aanandan the brave hearted hero and Sachu the lovely princess. The camera was by cinematographer Muthuswamy. Apart from being the most popular number in the film “Roja malarae Rajakumari” song has a colouful history inter – twined with the destiny of “Veerathirumagan”. As stated earlier the movie moghul AV Meyyappan was quite uneasy about producing the film. He was somewhat apprehensive about letting his young sons go ahead and produce a film independently. More importantly he was unsure about the ability of AC Trilokchander who was directing a film on his own for the first time. Therefore AVM chettiyar wanted to test the mettle of his producer sons and first time director before committing himself further. So he asked them to film a song first and show it to him. The trio of producers and director Trilokchander got together with the music director duo Viswanathan – Ramamoorthy and lyricist Kannadasan. 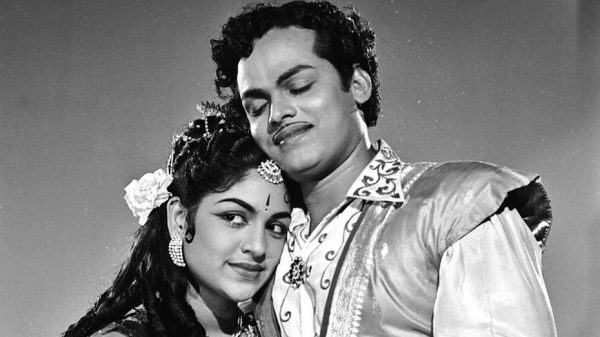 They decided to film a romantic duet between the two lead actors Aanandan and Sachu.During preliminary discussions the third son AVM Saravanan – who went on to don the mantle of his father as AVM productions administrator after Meyyappan’s death – suggested the opening line “Roja malarae Rajakumari”meaning “Oh Rose flower Princess/ Rosy princess”. Kannadasan liked it. He went on to write the words smoothly to fit the melody composed by MSV – TKR thereafter. The song was filmed within AVM studio precincts first. In a sense “Roja malarae” was the theme song outlining the romance in the film. The hero sings out to the heroine about the differences in their status and wonders aloud whether a romance between them is proper or whether it could flourish? The princess brushes such misgivings aside and emphasises that true love could always triumph. It was this exchange between the two lovers that added to the appeal of the song. AV Meyyappan was particularly impressed by director AC Trilokchander in filming the song. He was now convinced that the film would be made well under Trilokchander’s direction. Thereafter AVM Chettiaar backed Veerathirumagan enthusiastically. He was prepared to spend lavishly as a costume drama of this type would incur heavy production costs. AVM also wanted several scenes to be shot in different outdoor locations. He told his sons and the director that “Roja Malarae Rajakumari” itself should be filmed again in an exotic outdoor location. So now the film company Murugan brothers along with director Trilokchander decided to shoot the song again in the Hogenekkal – Melagiri area near Dharmapuri. Hills, rivers , fields and forests provided the backdrop. AC Trilokchander demonstrated his directorial skills by devising particular angles to suit the words of the song. Since Sachu was the princess she was filmed on higher ground and the commoner Aanandhan on lower ground. Initially the camera from a lower angle “looks up” st the princess while the commoner voices doubts about the gap between both. When the princess replies the camera from a higher angle “looks down” at the hero. Then they progressively get closer and express their love more intimately. The rocky terrain of Hogenekkal as well as the Cauvery river stream were utilised well for shooting scenes. Though a black and white film the scenes really sparkled on the silver screen. One reason for the commendable cinematography in the film was the use of zoom lens in shooting most of the scenes.Another first in Tamil cinema. It became clear that “Roja malarae” was going to be a hit even as the song was being filmed. A large crowd of people had gathered at the shooting spot. When the director shouted “cut” after shots and stopped the shooting between scenes the crowd got restless. “ Why are you stopping such a good song with a lovely tune?” they grumbled at the director. So production assistants had to calm the crowd by explaining that they could not film the entire song in one long take and that the director had to shoot it in parts. However they assured the people that the whole song would be shown without any cuts when the film was screened. This experience indicated to the film makers that “Roja malarae” was going to be a popular hit song. That is exactly what happened. As I wrote earlier the songs of the film became hugely popular long before the film was screened.The top hit of all was “Roja malarae Rajakumari”. The melody composed by MSV – TKR , the musical interludes, the words written by Kannadasan and the sweet singing of Sreenivas and Susheela enabled the song to captivate people even before the film was screened. The producers themselves cashed in on the situation by resorting to a novel advertising gimmick when the film was initially screened. 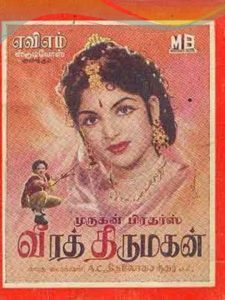 The posters, hoardings and handbills had the phrase “Roja Malarae Rajakumari” in big letters on top and the film’s name “Veerathirumagan” in smaller letters below. Another novel advertising method adopted was to publish a series of advertisements in a single issue of popular Tamil newspapers and magazines. The readers would see an advt for the film on one page and then find other similar advts too in the following pages. This approach was then the first of its kind in Tamil film advertising at that time. The film was also propagated through neon light advertisements installed on Mt. Road (now Anna saalai) . This was the first time neon advertising had been done for a Tamil film. Despite all these advertising techniques and popular hype the film did not run as well as expected in Tamil Nadu. It did not lose money but certainly did not turn out to be a money spinner. 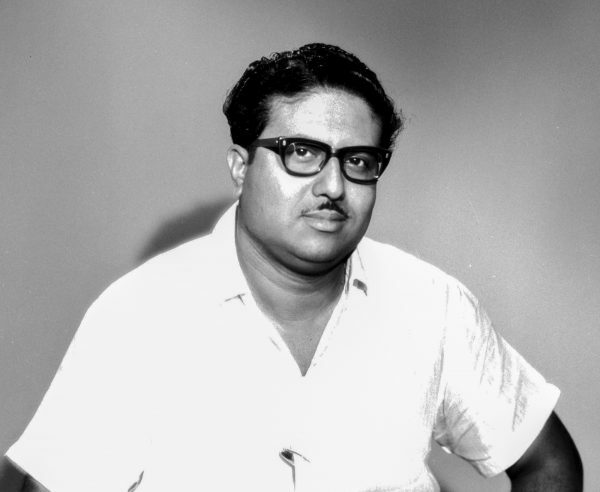 The film however established AC Trilokchander as one of Tamil cinemas foremost film directors. The hero and heroine Aanandan and Sachu too were not very successful as lead actors. Aanandhan acted in some more films as a hero but later became a villain actor. He also did character roles. Sachu got to act as heroine in a few more films but soon became a comedienne from the film “Kathalikka Naeramillai”. She continues to act in Tamil films to date. The response was different in Sri Lanka. Both the songs and film were very popular in the Island . The film ran for several weeks at a stretch in many theatres.Thousands of Sinhala film goers flocked to the theatres to see “Veerathirumugan”. Hundreds of “Sinhala” lips were singing the “Roja malarae Sajakumari” song albeit with a Sinhalaised accent. Many years after the film was first screened , I saw “Veerathirumagan” at the New cinema in Kurunegala in the seventies of the last century. The audience comprised Sinhalese,Tamils and Muslims. When”Roja Malarae Rajakumari” was played out on screen the whole theatre burst into applause.Some even shouted out the opening lines loudly. Such was its popularity in Sri Lanka. Though Veerathirumagan was not a major financial success and the lead actor –actress dream pair fizzled out subsequently the popularity of the song “Roja malrae Rajakumari” prevails still. It is a perennial favourite in Tamil Nadu and in Sri Lanka. It is one of my favourite film songs too. On a nostalgic note the song revives memories of a person whom I liked very much .Among the many non – Tamil friends of our family in Colombo was the Randeni Arachchi family.They had two daughters Tamara and Priyanthi. Some years later a son Ruwan was born. Randeni aunty taught at Wolvendhal girls high school along with my mother. Randeni uncle who worked at Sulaimans hospital was a very jovial friendly person.His twin interests in life were soccer and Tamil films. When I was a kid, Randeni uncle has taken me to see films as well as football matches. He liked the song “Roja malrae Rajakumari” very much. He would ask me very often to sing the song. When I sometimes fumbled for words, he would prompt me. He knew the song by heart. Sadly he died in a drowning accident while bathing in the Kelani river.Whenever I listen to “Roja malarae Rajakumari” I am reminded of Randeni uncle telling me “Rajan, sing Roja malrae Rajakumari, will you”?